You know what yesterday was? The Ides of March! So, let’s all just pretend that I’m being super timely and relevant, instead of just a little obscure with an obvious filler article. For those of you who don’t know, the Ides of March mark the day when Roman general/dictator Julius Caesar was murdered by his friends and comrades, supposedly because they feared him growing too powerful, but also probably a little bit because they were jealous. Now, Caesar needs no help being famous, and while there are several documents reporting the assassination, the most ubiquitous is, as always, Shakespeare’s. 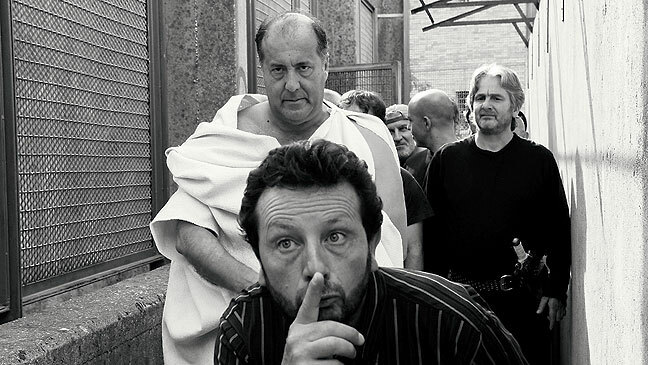 The Plot: In this half fiction/half reality/sometimes black-and-white Italian pseudo adaptation of Shakespeare’s Julius Caesar, a group of prison inmates come together to stage the tragedy, discovering that the centuries-old material speaks to them on an individual level, in ways they might not have expected. This is sort of an odd movie, and I’m not perfectly confident in how to review it, but I’m going to try my best. Referring to the story as a “plot” in this case doesn’t quite feel right. The word “plot” implies something very contrived and purposely constructed. 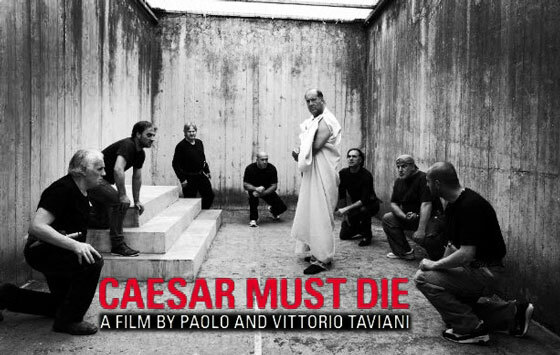 Indeed, there is a constructed narrative in Caesar Must Die, but it’s steeped in a heavy dose of reality, which somewhat complicates my reading of it. Okay, let me break it down for you: The fictional narrative of the story involves a theatrical director entering a real Italian prison and putting on a production of the play with prisoners. The real-world story behind the film involves the filmmakers entering the same real prison and employing real prisoners to act in the film, about prisoners performing Shakespeare. The actors are actual inmates in a maximum security facility, guilty of crimes including drug trafficking, organized crime, and murder, and serving lengthy sentences ranging from fourteen years to life. So yeah, they’ve got real people playing themselves playing characters in Shakespeare’s Julius Caesar for a movie about Shakespeare’s Julius Caesar. I hope it’s not just me, but that’s sort of a complicated conceit for a film, right? Should I not have mentioned it? Since the actors are playing themselves, the writers don’t feel confident enough to characterize them fictionally, which is understandable, but since the prisoners are also making pretty genuine attempts to perform some difficult material, they don’t much come across to the audience as themselves. Because most of the film is Caesar, we spend far more time watching Shakespeare’s characters, not the men playing them. Instead of Salvatore Striano, we get Brutus. This wouldn’t be a problem if directors Paolo and Vittorio Taviani hadn’t made a point out of identifying Striano and Brutus as separate characters. Let’s think about Joss Whedon’s Much Ado About Nothing, starring Alexis Denisof and Amy Acker as Benedick and Beatrice, respectively. It is an adaptation of a Shakespeare comedy, and while we are aware of Denisof and Acker playing their parts, they are not characters in the film. Benedick and Beatrice are characters. You may have recognized what I just described as a basic construct inherent to all narrative cinema and theater. Denisof and Acker are interesting people, but the story of them making the movie belongs as a DVD bonus feature. I like the idea that the Taviani brothers explore here. Prisoners coming together and learning over theater is a good story. Julius Caesar is also a good story. Unfortunately, there’s just too much Caesar for the other story to survive. Equally problematic is the fact that there’s just not quite enough Caesar for it to be a good adaptation. I think the Taviani brothers would have done well to pick one or the other for their film, or maybe to strike a better balance. An adaptation of the play set in an Italian prison would be, as the kids say, pretty dope. An original story about prisoners performing Caesar would be just as good. One or the other, though, guys. They just got greedy. Brutus shared the stabbing with all the other senators. He did’t get greedy. So, how are the performances? Well, guys playing themselves works out fine. Surprisingly, though, the men all give dedicated, emotional performances as their characters in Caesar. These fellas can indeed act. The aforementioned Salvatore Striano really steals the show as Brutus, but he had prior experience on the stage. It turns out well for the Tavianis, though, whose main objective was to humanize inmates and demonstrate the civilizing power of culture. They may have done better, as I said, to just shoot a straight adaptation filmed entirely inside the prison and entirely with actual inmates, letting some expository titles at the beginning inform the audience of what they’re seeing. Their goal is accomplished, though. Even convicted murderers can play Shakespeare. Of course, there’s a joke to be made about the fact that the inmates are mostly playing assassins, but I’ll try to avoid it. It would have been less dramatic, and perhaps less poignant if instead they put on The Merry Wives of Windsor, but it sure would’ve been a lark, eh? ← SciFridays: 100th Post Extravaganza – “The Fall” (2006) & a Giveaway! 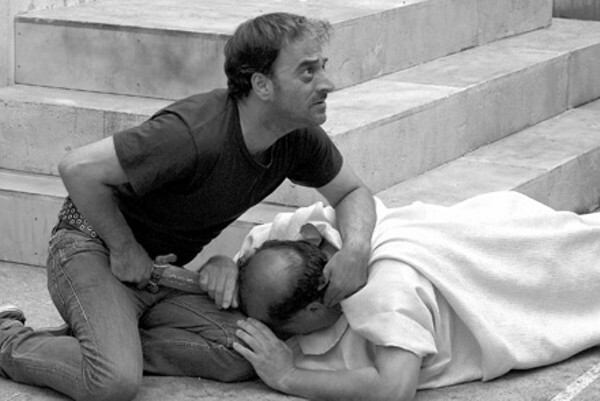 The Ides of March will get you every time. 🙂 Great post by the way.